Activities in hospitals and private practice of doctors in Tripura have resumed after doctors and health workers declared to suspend their agitation for the time being. 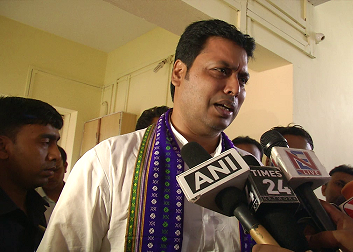 The decision came after they expressed their satisfaction on meeting the state chief minister Biplab Kumar Deb who had already ordered for setting up of police pickets in the major hospitals and arrest those involved with the physical assault of a surgeon. Hospitals were functioning normal after two days and private pathologies are again open and patient parties have expressed their satisfaction over the service of the doctors and health staff. Other than health staff, agitation that also hampered the service in the hospitals are the simultaneous two days holidays due to the ongoing polling and holiday on second Friday. Meanwhile, doctors also viewed that things are again gradually becoming normal though they felt that quality of the service by doctors and health staff are not up to the mark as because of the shortage of health service staff and is one of the prime reason behind the conflict between doctors and patient party.